We don't have an exact birth time for Brian Jones. However, author Stephen Davis in his book, Old Gods Almost Dead - The 40 Year Odyssey of the Rolling Stones, says that Brian was born on a winter's Saturday night. Assuming this information to be true, we can assume that he was born sometime between sunset and midnight - giving three possible ascendants (Virgo, Libra or Scorpio). Astrologer, Nick Dagan-Best has assumed a 7pm birth for Brian which would give him a Virgo ascendant. However, everything I have read and perceive about him makes me feel that he did not have Virgo rising (I also interpret "night" as later than 7pm). I am therefore inclined to believe that Brian had Libra rising, with Neptune conjunct the ascendant, and I have rectified his chart accordingly. It makes perfect sense that Venus, as ruler of Libra, was his ruling planet. This puts the focus on his dandified and flamboyant image, and his androgynous good looks (he was the best-looking member of the Rolling Stones). Another reason that a Libra Ascendant is more fitting is that Brian is said to have had an extremely charming and well-mannered side to his nature. Most of his girlfriends and later his elderly housekeeper, were agreed on this. He was also very sensitive, which suggests that Neptune was close to the ascendant. In my adopted chart, Venus is on the fifth house cusp (in trine to Neptune). Hence prominence is given to the two planets most associated with musical ability (Venus and Neptune). Brian's natal Venus, making a trine to Jupiter in Gemini, suggests the wide range of instruments that he played, such as the sitar that can be heard on the song, Paint it Black. It is interesting to note that the sabian symbol for one degree of Libra is a butterfly pierced by a dart (which, as we shall see, is a very appropriate symbol for him). 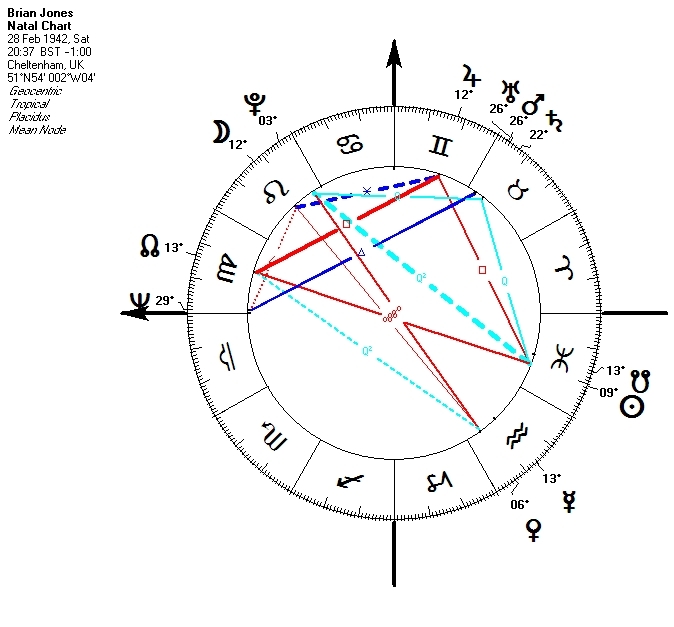 Brian's natal Sun in Pisces makes only one major aspect - a square to Jupiter, which is in detriment in Gemini. Thus, he did everything to excess, but was not strong enough to maintain such a lifestyle. It should also be noted that his natal Sun makes a tight quincunx to natal Chiron, and that he also has a Moon-Pluto-Chiron conjunction. We may associate these aspects with the rejection that he experienced from his parents, and the emotional wounding which followed. Brian's mother was said to be manipulative, and in later life favoured his sister, Barbara. At the age of four, Brian's first baby sister had died of leukaemia. However, it is said that Brian's parents kept their son out of their grief, and that the frightened child feared that he might disappear in the same way as his sister. After this, Brian suffered from asthma, and became an outsider. He was given a typical middle-class upbringing in Cheltenham, but showed rebellious tendencies early in life (he once led an uprising against the prefects at school, for which he was suspended). His rebellious behaviour is shown by his close Mars-Uranus conjunction, which is also conjunct natal Saturn. Despite his rebellious behaviour, Brian was intelligent, acquired nine O-levels and two A levels (Mercury in Aquarius trine Jupiter in Gemini, perhaps?). His parents wanted him to become a classical musician, and were thus disappointed with the lifestyle that he adopted. His primary interests were girls plus jazz and blues music - interests which he supplemented by taking menial jobs. One night, he returned home to find that his parents had gone away, locked up the house, and left his things outside in a suitcase. Brian Jones was the founder of the Rolling Stones, and chose the other members of the band. He played lead guitar and blues harmonica, and was certainly a superior musician to the others, at the beginning. When he founded the band in 1962, Brian's natal Sun was progressing from Pisces into Aries, which was very appropriate for initiating something new (remember, the Stones were one of the very first British rhythm and blues bands). For the first two years of their career, the Stones got on well. However transiting Uranus was opposing Brian's natal Sun in late '63 through 1964, and his adopted role as leader of the band was overturned during this time. Mick Jagger and Keith Richards had long been friends, and once the Stones were established, the duo showed a talent for song-writing, that Brian didn't have. This partnership was encouraged by their manager Andrew Oldham, who wanted the band to move in a more commercial direction. Thus, Brian was pushed to the periphery of the band. Craving attention however (note that he has Moon in Leo) he used his image to become the main focus of attention onstage. In 1964, and in true Piscean style, Brian was one of the first musicians to take LSD. Once his leadership had been usurped, he combined the use of alcohol with an extensive drug intake. Also, at this early stage of his career, Brian is reported to have said that he did not believe he would live beyond the age of twenty-seven. I would now like to look more closely at issues relating to Venus in Brian's chart - especially since this may be his ruling planet. Brian achieved an early notoriety as a womaniser, and had five illegitimate children by different women. Three of these were born before he was twenty years old. With his natal opposition between the Moon and Venus, Brian seemed to have split women into mothers and lovers. When a lover, turned into a mother, he rejected both the mother and child, and found a new lover. To Brian, too much emotional closeness could lead to the same stifling family situation that he had escaped from (note the natal Moon-Pluto conjunction). In Brian's chart, Venus is in mutual reception with Uranus, and he wanted complete freedom in relationships. However, at the same time, he was insanely jealous and possessive of his girlfriends, as we might expect with someone with a Moon-Pluto conjunction and Venus-Pluto opposition. This same opposition led him to obsessively acquire beautiful clothes and expensive antiques, possibly to compensate for the lack of real love in his life. One girlfriend, Suki Potier, said that the only person Brian ever made love to was himself! Brian finally met his match when he formed a relationship with Anita Pallenberg, the German Blonde model. Pallenberg was beautiful, intelligent and powerful - a perfect anima figure for Brian. It is said that Pallenberg led him into cross-dressing, and also into occultism. Legend has it that she once practised voodoo on him by making a wax effigy of him and sticking pins in it. Apparently, he woke up with severe stomach pains, the following day! His relationship with Pallenberg was extremely volatile and brought out all his insecurities. In turn, he is said to have periodically beat her up, which apparently was something he also did with his other girlfriends. Strangely though, none of the women that he allegedly beat up, left him, for this reason. Brian's violent streak is most clearly illustrated by his natal Mars, which is in detriment in Taurus, and conjunct Uranus. Since Saturn is also conjunct here, Brian was prone to hold back, then have explosive outbursts. In his beautifully written book, Brian Jones - The Last Decadent author Jeremy Reed suggests that Brian was a repressed homosexual, and that his violence towards women was related to this. However, a friend tells me that many of the London in-crowd were into sexual experimentation at this time. Furthermore, ex-Rolling Stone, Bill Wyman in his book, Stone Alone has said that it was a myth that Brian was gay, and that to the contrary he was "a sexual athlete" I suspect that Brian's violence towards women may well have been misdirected anger towards his mother. From the mid-Sixties to the end of his life, transiting Neptune was opposing Brian's natal Saturn-Mars-Uranus conjunction. This resulted in any remaining stability being removed from his life, and brought sexual confusion along with a general state of chaos and anxiety . With his natal Mars-Uranus conjunction trining Neptune, Brian used drugs and alcohol as a means of escaping reality (i.e. Saturn). He thus became a liability to the Stones, either by not being well-enough to play, or just not turning up to rehearsals. The biggest blow to Brian was when he went on holiday to Morocco, with the other Rolling Stones, and some of their crew and girlfriends. It was here that it became apparent that a mutual attraction was developing between Keith Richards and Anita Pallenberg. Brian was taken sick there, and while he was in hospital, everyone else abandoned him. This was basically the end of his relationship with Anita, and the beginning of the end of his relationship with the Stones (with Richards becoming an open-enemy, so to speak). During the three weeks that Brian was in Morocco, there was a exact transit of Saturn, by conjunction, to his assumed descendant, thus helping to validate the rectified chart. To quote Brian "they took my music, they took my band and now they've taken my love". As if this were not enough, further problems followed. One night Brian talked about his drug use to an undercover reporter in a club. Three weeks later, the story appeared in News of the World - the only problem was that the reporter didn't know which Rolling Stone he was talking to, and attributed the story to Mick Jagger! Subsequently, Mick sued the News of the World. This increased the Stones realisation that Brian was a liability, and set both the press and the police on the Stones trail with a vengeance. First, Mick and Keith were busted, and then Brian was busted twice. By the time of the second bust, he is said to have become so paranoid that he was even afraid to have alcohol in the house. Thus, it seems almost certain that the second bust was a set-up. At his first trial, Brian was sentenced to nine months in jail. However, a psychiatrist managed to persuade the authorities that Brian was in no fit state to receive such a punishment, and that it could potentially lead to him committing suicide. Thus, he escaped with a £1000 fine. However his paranoia increased. In October 1968 he returned to Morocco to record the Pipes of Pan at Joujouka - the nearest thing that he ever made to a solo album (the same month, his progressed Sun made an exact sextile to his natal Venus). While he was in Morocco, Brian pointed to a sacrificial goat with a fringe of white hair and said "That's me!". The goat was then slaughtered, and twenty minutes later it was being eaten on kebab sticks. In late October 1968, Brian's progressed Moon made a conjunction to Pluto, and he began the process of changing his lifestyle. One month later, he purchased Cotchford Farm, formerly the house of A.A. Milne who wrote the Christopher Robin stories. Psychological astrologers may well recognise Brian as a "puer aeternus" (eternal-youth) type, and will understand why he had an affinity with such a figure as Christopher Robin! At Cotchford Farm, Brian cultivated a quieter lifestyle, and reportedly gave up drugs , even though he still carried on drinking. Brian, who (as a Pisces) was a good swimmer, took regular swims in the swimming pool there. Towards the end of his life he invited a Swedish girl named Anna Wohlin to live with him, and if her biography is true, they achieved some degree of happiness together. Throughout Brian's time on Cotchford Farm, however, there were other people around - his housekeeper, a gardener, and a man named Frank Thoroughgood who led a team of three builders, who were brought in to do renovations on the property. Thoroughgood had previously worked on Keith Richards house, and was a friend of the Stones tour manager, Tom Keylock. With Brian's agreement, he moved into the annexe of the house and spent several days a week there. From the moment they moved in, Thoroughgood and the builders allegedly took advantage of the situation. They are said to have done little work; brought their mistresses in; charged various expenses to Brian's accounts and also to have stolen money, food supplies and other things from him. They were all working class types and thought that Brian was a spoilt rock star, who was ripe for being exploited. To add to Brian's traumas, on 8th June, three of the Rolling Stones turned up at the farm, and told him that he was no longer required in the band. They agreed to give him a one-off payment of £100,000 and then £20,000 per year for as long as the Stones remained as a band. On 2nd July, Brian finally plucked up the courage to tell Thoroughgood that his services were no longer required. However, he felt rather bad about it, and later in the evening invited him for a swim. When Brian's girlfriend, Anna and Thoroughgood's friend, Janet went into the house, Brian was left alone with Thoroughgood in the pool. Thoroughgood then joined the ladies in the house, and shortly afterwards, Janet found Brian drowned in the pool. The police assumed that Brian's death was due to drink, drugs or asthma, and few questions were asked at the time. However, it has since come to light, that Brian had only minor traces of a prescribed pill, a moderate amount of alcohol, and had no signs of having had an asthma attack. Many years later, Thoroughgood, on his death bed, is said to have confessed to Tom Keylock, that it was he who killed Brian. Nick Kollerstrom has pointed out the common transits involving Uranus and Neptune in all the "Club of 27"charts. However, at the time of Brian's death, transiting Neptune was exactly opposite his natal Uranus, and transiting Uranus was exactly conjunct his assumed Ascendant and natal Neptune. It was also exactly square his assumed MC/IC axis, whilst transiting Jupiter was conjunct his natal Neptune. All of these transits involve Uranus and/or Neptune, thus suggesting the suddenness of Brian's death, as well as death by drowning. Another exact transit that occurred was transiting Saturn in the eight house (of death) squaring Brian's possible chart ruler, Venus. In March of 1969, there was a solar eclipse opposing his natal Neptune. Shortly before this, he had made a trip to Ceylon, where a man claiming to be Hitler's astrologer had warned him not to go swimming alone. There are several possibilities of why Brian Jones may have been murdered. The first is that it was accidental, since he had been provoking Thoroughgood in the pool, and Thoroughgood may have accidentally ducked him for too long. The second possibility is that Thoroughgood intentionally killed Brian to cover his own tracks after exploiting him. Another more sinister possibility, which I wouldn't totally discount, is that Brian's murder was a contract killing. Apparently, Brian had been looking into the possibility of starting a band with John Lennon and Jimi Hendrix, and thus could have broken up two major bands in one go. For this, and various other reasons, there are a number of people who may have been happy to see the end of Brian. Apparently Alan Klein, the Stones manager, had asked why they were promising Brian so much money, after his departure from the band. Tom Keylock's role in this is also very questionable. Officially, he denied being at the farm on the night of Brian's death, but later when interviewed admitted to having been there. It was also Keylock who ordered that many of Brian's clothes and possessions be burned immediately after his death. Brian himself is said to have believed that his life was in danger for some time. Furthermore, there are varying accounts from the key witnesses as to exactly when and what happened on the night of his death, and how many people were present. Two independent sources, including ex Walker Brother, Gary Leeds, claim to have seen someone resembling Brian pushed under the water by three men (presumably Thoroughgood and two associates).